How's life? Great, I hope and I pray! She says she is stressed. Can you believe that? It takes every ounce of my energy to NOT speak the words of how to destress yourself and I didn't. Well, I use to all the time, to everybody because I want to heal the world. I want to tell people that stress is created by fearful beliefs, and thoughts. But, I have discovered that many people need someone to listen with love rather than preach and teach. There are so many people who are anxious, angry, depressed, fatigued, moody, and unhappy and they need, more than anything in the world, to be listened to and supported. I have learned to listen, and love. I have learned to feel more, and talk less when someone is venting about their stress. Your stress, my friend, is fearful thoughts you keep thinking by default. Stress is created by thinking of all the bad things that "might" happen. Stress is sustained by obsessed fearful thoughts of not being able to handle the future. You may be so focused on beliefs that you are overwhelmed and those beliefs create fear and anxiety. Have you ever gone through a really tough time or had an experience that had you thinking that this is the worst thing that has ever happened to you? Of course you did because you are still here and you are still standing. What if you were to think, no matter what happens, I can handle it, because I always do? What if you focused on that? The best possible outcome? What if you knew choosing beliefs is free agency, and the difference between default and desire? I pray you feel the truth of faith in God, and in yourself! you may contemplate it, practice feeling the truth in it and allow it to fill your entire being. When you do, you will feel your way into destressingyourself. How are you doing this day? I pray with all my heart and soul you are doing okay! One of my theories about life is.. There are those who will lift themselves and others because they know their value and worth. These are people predominately whom have overcome immense struggle and suffering, and have figured out happiness, i.e., success, comes from within. There are those who will lower themselves and others because they are unaware of their value and worth. These individuals have had harsh conditioning at a young age and/or a devastation, or devastation's, they have experienced, which gives way to thoughts of insecurity towards life. These are people whom are not easy to be around. There are those who lift and lower themselves and others in any given moment based on their mood. These are the average functioning people of our society. The first category of people mentioned are very confident because they know their value and worth. The second and third types mentioned are those who experience much insecurity. Another theory I have is that insecurity is a humongous wall to development, and healing because it is more important for an insecure person to be right about themselves than to improve. Thus, all the blaming of their unhappiness on others, and/or their label. This behavior can, and will keep any being stagnant. To believe that others could, and should, control their behavior towards us to make us happy, and not believe in the control of our own behavior is a bit insane. We, unlike animals, have the free agency, the power, and the responsibility to choose what we can, and will do, say, and think. I was meditating this morning, as I do every morning, and I felt compelled to write this theory of mine. This may, or may not resonate with you. But, if it does, it does, and if it don't, it don't. Either way, it's okay! How to Destress Depair is what I would like to blog about this day. Hello there my lovely friend. My dear brother/sister! In my last post, I indicated that I wanted to begin a journey of Destressing Moments of Despair. The number one thing I talk about with people with critical stress is how to destress their life, and I always, always, always speak the words of faith, hope, and charity. I believe in God with all my heart, mind, and soul. Why do I believe in God? One of the reasons I believe in Him is all the miracles I have seen, and all the opportunities He gives me to participate in these miracles. The scriptures are all about God, and the teachings about, and from the Lord are all about destress techniques, stress management, and stress relief. The reason this is one of my favorites is because it is the remedy for stress, especially critical stress, and despair. Stress is caused by our reaction of doubt, fear, and worry to any event, or experience. The opposite of doubt, fear, and worry is faith. So, if we have faith, and believe in the best possible outcome that can happen, we relieve our stress. If we don't have faith, and we have fear, we most certainly will have anxiety. The opposite of despair is hope. If we have hope we can feel motivation, and inspiration. However, if we don't have hope, we become hopeless, which often causes depression. Charity is said to be the pure love of Christ. I believe that "perfect" is like Christ, pure love, i.e., unconditional love! God is pure unconditional love. Love is the most powerful emotion in the world. When we feel love more often we can feel really great most of the time, and I believe living the pure love of Christ, aka charity, we live near perfection. If we live with the pure love of charity, we become nearer to perfection. Without a doubt, this state of unconditional love can, and will give the gift of living with less stress, it's as simple as that. My friend, my friend, one of the best ways to destress your life is to have faith, hope, and charity. Eliminate your stress by replacing fear with faith, despair with hope, and anger or hate with charity. Destress your life with faith, and hope that the best possible outcome can, and will come to pass. Abide in charity so that you may feel the love that comes from you by being connected to God. The way to having faith, hope, and charity is to practice. When you feel fearful, and hopeless, ask yourself, "What am I thinking about right now?" And then consciously spin that thought around to what you want. It really is that simple, but may not be easy. With practice though... You can and will succeed. The best way to practice charity is being kinder to yourself. Caring enough about yourself that it really matters how you feel and think because how we feel and think is what makes or ruins our moments in life. That last sentence may be a little, or a lot, difficult for some to comprehend and/or hear but it is the truth. God has given us the freedom to choose our thoughts. Choosing our thoughts IS our free agency. The human experience most often teaches us to think like the masses, which creates thoughts of competition. Competitive beliefs creates habits of comparing, complaining, condemning, criticizing, dramatizing, and gossiping. We do not have to compete! In fact, no where in the Bible does it say we are to be contestants in, or of this world. However, it is written to love one another. Dear sweet brother/sister of this beautiful world, when we practice faith, hope, and charity it can, and will destress despair. And not just because the Bible tells me to. Today, I want to begin a journey of destressing despair. I hope and pray you are doing more than okay. For many years I suffered deep moments of despair. 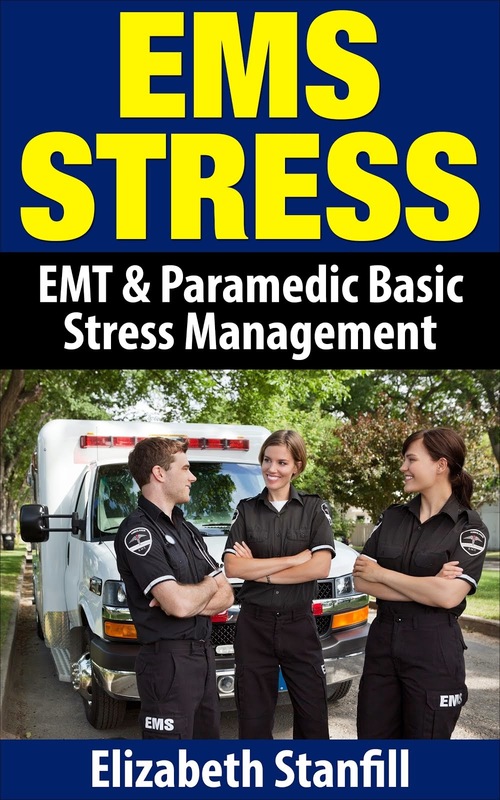 For many years I responded to people in distress, as an EMT, on 911 (emergency) calls, and then I began my profession of responding to Emergency Personnel in deep moments of despair. Now, on occasion individuals will contact me who are experiencing the same. It is my personal opinion, when a person is suffering emotionally to the point of anguish, desperation, and hopelessness, it is quite possibly the worst feeling anyone can, and will experience. I know this because I personally experienced it for years, and have seen thousands of people suffer from it. The most important part of my experience is, I've witnessed relief in others and myself! I've witnessed healing from despair over and over and over again, and continue to see it. Additionally, I want to help anyone suffering and point him or her to the direction of peace. If you are suffering emotionally, I would like to help point you in the direction of solace. It is my prayer that you will find a way to lift yourself from your broken heart no matter the cause. For it is you, and only you, who can, and will find rest for yourself if you seek it. God is real, and if you turn to Him, He will comfort and strengthen you in that moment. Comfort and strength does not always last long when we are suffering. Matter of fact, we may only get glimpses of relief, one moment at a time. Therefore, we must continue to turn to God, every minute, of every hour, of everyday for our entire life here on earth. Many people go to church on Sunday, and find respite from their emotional suffering. Then the week begins and life sets in with family, finances, relationships, and work, and so goes the stress, and the week. Then Sunday comes again, and more emotional rest. So goes the cycle. I have learned that connecting to God, throughout the week, with quiet contemplation, and conversation, not only gives me guidance and inspiration but, comfort and joy. Yes! I converse with God, and I listen. He shows me evidence that He is real and I show Him faith that I know He is real. I have frequent inner knowings of numerous things, and I know that these knowings are guidance and inspiration from God. I've known God is real since a very young age of about four years old, and now at the young age of fifty four, my time is very much consumed with this knowing. There is no more despair because I turn to God more often than I ever have, and I just continue to. There is no more anger, anxiety, or depression in my life because I feel God every moment, of every hour, of every day. Straight up! He is my life, and I talk about Him in nearly every conversation, and I walk with Him in nearly every step. Please know that I am very human, and so I am imperfect. Sometimes I do get feelings and thoughts that I do want to get angry, anxious, or depressed but for only very teeny weeny moments. When I do want to have negative emotions, I will immediately giggle at myself because I have learned to laugh at me. Fearful feelings are human habits of this human experience that do diminish with proper practice, just as they grew with practice. It's alright if you do not believe me, but that is where it all begins, in a belief. To just believe is a glance at faith, then it takes repeated belief, and repetitive behaviors to get to where I proclaim to be. Certainly, my faithfulness and fearlessness for love and life did not happen over night. Please understand, I do not believe I am better than anyone, and I am not bragging! I'm trying to prove there is destressing despair. Also, I believe in my capabilities within my confidence in God only because of the past fifty years of personal evidence, and the past twenty-seven years of witnessing others heal in a professional environment. I know with all my heart and soul it takes faith and practice my friend. The first step is to turn to God, and just keep on a practicing. That's all I do is practice and I love unconditionally. Love is the remedy for all despair. If you do not believe in God, doubt your faith in Him, or just want to strengthen your conviction, ask Him for help, quiet your mind, and listen. He will show you He is real, especially if you are in despair. This is the beginning... connecting to and turning to God, is the first step for relief from moments of sadness and sorrow. You are so very special to Him! Seek Him more, and you will know, if you don't already know that this is true! God bless you my dear sweet friend! My dear sweet brother/sister of this world. Today, I'd like to talk about a great way of destressing you. I pray you are alright, and are taking the time to lift yourself, one day at a time, and everyday. As you may notice, I talk about ways to heal the hurt, and I repeat my posts in different ways. What I mean is, I talk about creating stress relief habits by developing inner peace and quieting the mind a lot but, in different ways. There are three reasons I do this. First, you will find peace in quieting the mind because it is one of the most powerful ways to connect to God. Second, if I write about it in different ways, eventually I can, and will, persuade the stressed person to destress. One way or another, I may convince the suffering individual to choose and use their free agency, and power to find relief through focus. Third, reminding and repetition are great ways to recondition stressful habits into destressing habits. A great way to Destress Yourself is to intentionally enjoy the moment you are in. Often times we are thinking of all the things we have to do, what may happen tomorrow, or what happened yesterday. If we can intentionally take the time to enjoy the moment we are in we will discover a great way to relieve stress. When people are young, it is so very easy to have fun and play but then life sets in and adults teach us, and train us to take life too serious. Sometimes we are trained out of enjoyment because it is replaced with fear. When you are eating some chocolate or a delicious meal, notice every bite and focus on the moment, and enjoy. When you are having a conversation with someone you really love, or like, notice the time you are spending together, and enjoy. This is choosing to stop the thoughts of other things and focus on savoring the moments. One of my favorite things to do is focus in the moment I am in. I quiet my mind, focus on the person I am with, and the place I am at. I just quiet my mind, and savor the person, and place. I find complete enjoyment in that moment. I find God in that moment. This is one of my quieting the mind, and finding inner peace practices. Sounds simple but it is absolutely amazingly awesome! Put savoring into practice, and you will be able to Destress Yourself at any time and any where. All's I got is love for you! Today I'd like to talk about healing stressful habits. I pray in the most emphatic way that you are okay. Being human, by nature, is very stressful. It is that way because without the hurt we could not heal, without the struggle we could not discover success. Being human is our spiritual schooling of expansion. Think about it for one sec please. We could not know what we really want unless we experience what we don't want. We could not know what is desired until we experienced the undesired. The tricky part is, what we all want, what anyone wants is to be happy. The opposite of happy is stressed. Stress is fear, and fear causes all negative emotions. My theory is there are three stages of life; innocence, adolescence, and enlightenment. Innocence is the way we come into this world, loving to learn, loving to listen, loving to love, and loving to understand. We are innocent spiritual beings, pure unconditional love, entering the human world. Adolescence is what we become when we are taught to compare, compete, complain, and criticize. We are taught these habits by our care givers, parents, and teachers. Life teaches us to try and be the best, or better than others, and when we aren't we are losers. Life teaches us that happiness is outside of us through what we have, and how others treat us. There are many adults that are still adolescent, comparing, competing, complaining, criticizing, dramatizing, and gossiping. Where do you think teenagers learn it? I understand many people will disagree with what I have just stated because they do not want to hear it. I also understand that many people will refuse to see the truth in it. Teenagers are the most awesome individuals that rebel because they become confused between the innocence and adolescence. Imagine being born unconditional love and then being taught to hate the self and others by way of focusing on what is wrong. It's confusing! The stage of adolescence is also looking for happiness outside of the self rather than searching for it within. It is when people leave their happiness in the hands of their own distorted beliefs and moods, unknowingly blaming others for dissatisfactions. Enlightenment is when we discover our spiritual nature of the unconditional love that we are. It's when one realizes happiness comes from the freedom of choosing one's focus, which establishes beliefs, which governs feelings, and directs actions. Enlightenment is when one reconnects with God, and when one begins creating habits that allows cooperation with God. Enlightenment is when we discover our power, our value, and our worth, which points to pure bliss in this life. This bliss is literally, heaven on earth from energized positive power of unconditional love. Enlightenment is the healing the stressful habits of being human. Enlightenment is releasing the negative emotions that one has learnt and practiced into near permanence, and reemerging into the unconditional love that he or she is. When we are pure innocence, we have no negative emotions. When we are adolescent, we learn and practice negative emotions. When we are enlightened, we spend time releasing negative emotions, and healing them because that is the hurt in this life. Everyone will experience negative emotions and hurt in this life. That statement alone indicates the learning the lessons of this human experience. Not one healthy "normal" person is exempt of stress in this human experience. Negative emotions are the stressful habits that must be healed so that one can get back to the unconditional love that he or she is. There are only two emotions, love and fear. All emotions fall under one or the other. Love feels like, eagerness, elation, excitement, exhilaration, contentment, happiness, joy, and unconditional love, because it is. Fear is anger, anxiety, depression, despair, frustration, irritability, misery, and moodiness, and it feels horrible. As we overcome our fear, aka stress habits, we release the negative emotions that never belonged to us, and become, or reemerge rather, into perfect love. Perfect in love is unconditional love, and that is what we are. Getting back to that perfect unconditional love that we are is the healing of the stressful human habits. Sorry I fibbed about keeping my posts short and sweet, and straight to the meat. Also... I love you my dear sibling of this world. Gonna write a little bit about relieving anger, anxiety, and depression today because those are the negative emotions that cause a whole lotta stress. I'm praying for your healing! I'm praying for your relief! First, if you are experiencing moods of anger, anxiety, and/or depression, know that it is not your fault. Chances are something has happened to you, or is happening to you that has aroused your fear for life right now. Could be, one or both of your parents trained you up in worry because they had practiced fear. Second, all negative emotions come from some sort of fear of not being okay. Anger is fear of not going to be okay if you don't get your way. Anxiety is fear of not going to be okay because of the dreaded future. Depression is fear of not going to be okay because one believes he or she or life is not good enough. Third, negative emotions get practiced into nearly permanence by default, and if one is not aware, one can, and will get deep into it. Fourth, this stressful state of negative emotions does not belong to you! Fifth, there is a way out but you gotta believe in yourself enough to think a thought in your favor. Finally, if you have been angry, anxious, or depressed for a long time, creating relief may not happen over night. One of the best ways to relieve negative emotions is to practice serenity. Serenity is found by practicing inner peace of mind. Whenever you can, sit still, follow your breath in and out, and feel for the knowing that you are safe, right here, and right now. That safety is recognizable, and that inner peace can be practiced into permanence but first, one must make it a habit. There is no greater relief from stress than the inner peace of mind and connecting to God. Inner peace is a way of connecting to God. Anyone can see it in others. Have you ever known anyone to be calm, and confident? That person has practiced it into permanence. Do you believe in yourself enough to quiet your mind for you, for your future serenity, and tranquility? That's all I got my friend! Here is another post I wrote on Releasing Negative Emotions. Well Hello Again My Friend! Destressing by way of appreciation and sleep is what I'd like to ramble about this day! I pray a powerful prayer that you are clear, happy, and healthy. Are you experiencing any fatigue? Do you have a hard time staying asleep? Did you know that sleep is vital because it takes energy to handle stressful life situations? Do you know that stressful times can, and will make it difficult to fall asleep and/or stay asleep? If it is not easy for you to fall asleep, or stay asleep, it may be due to a racing mind. Therefore, one of the most important things one can do before sleep is quiet the mind so that the thousand thoughts in the head cease. One way you can quiet your mind is to focus on the sounds as you listen to this video. But what if it is too challenging to lay in bed at night and focus on listening? The answer to that is, you could change your thoughts by way of appreciation. You could think of things that you really appreciate and are grateful for. You could think of things that happened during the day that you really liked. You could think of any angelic beings that crossed your path this day. You could think of anything fun or funny that happened this day. The thing about stress is it is provoked by things we think about in the state of anger, anxiety, or depression, aka states of fear. We may be angry about something at work, or at home. We may be anxious about the future due to finances or health. We may have deep sadness over any life situation. When we are thinking thoughts of stress it is quite impossible to relax because stress is the opposite of relaxing. When we think of people, places, and things we appreciate, we feel better, and we are able to relax. Please know, and understand, I am not asking or telling anyone to ignore the horrible things that are happening in life, I am asking stressed out people to change their focus so that they may sleep. We have the power to choose our thoughts, and if you do not believe that is true, one day you will. One day you will know the power that is within you to choose healing or hurting, helping or hindering. Every night, before I go to sleep, I pray a powerful prayer of appreciation. What that means is, I thank God for everything I have, and all the wonderful things that happened throughout the day. With practice, I've become so good at it, I can, and do, go on and on about the beautiful and brilliant things that happened. Every night I fall asleep, right away, right after my prayer. Every morning, I wake up eager, excited, and exhilarated for the day. I know with all my heart and soul that my deep sleep, and my energy renewed are because of the habit that I have of appreciation for life, and my connection to God. Choose to focus on appreciation for all the thingys before you sleepy. Go on and on and on in your head, and make it a habit. Practice it into permanence, and just watch you destress yourself and your sleep. Your life is really the most important thing in this world to you because the choices you make will break or make it. You've got the power my friend! God cares for you and loves you! He is giving you all good things for your spiritual expansion.